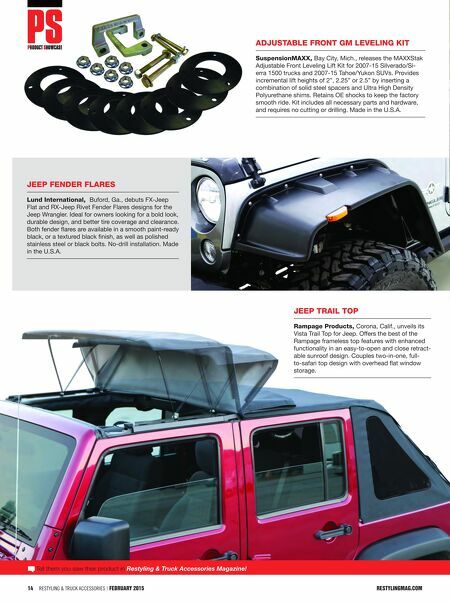 14 Restyling & tRuck AccessoRies | FEBRUARY 2015 restylingmag.com jeep fender flares lund International, Buford, Ga., debuts FX-Jeep Flat and RX-Jeep Rivet Fender Flares designs for the Jeep Wrangler. Ideal for owners looking for a bold look, durable design, and better tire coverage and clearance. Both fender flares are available in a smooth paint-ready black, or a textured black finish, as well as polished stainless steel or black bolts. No-drill installation. Made in the U.S.A. jeep traIl top rampage products, Corona, Calif., unveils its Vista Trail Top for Jeep. Offers the best of the Rampage frameless top features with enhanced functionality in an easy-to-open and close retract- able sunroof design. Couples two-in-one, full- to-safari top design with overhead flat window storage. 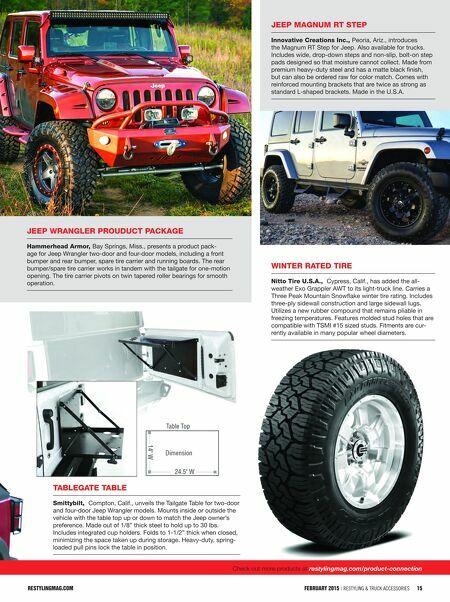 Tell them you saw their product in Restyling & Truck Accessories Magazine! adjustable front gm levelIng kIt suspensionmaXX, Bay City, Mich., releases the MAXXStak Adjustable Front Leveling Lift Kit for 2007-15 Silverado/Si- erra 1500 trucks and 2007-15 Tahoe/Yukon SUVs. Provides incremental lift heights of 2", 2.25" or 2.5" by inserting a combination of solid steel spacers and Ultra High Density Polyurethane shims. Retains OE shocks to keep the factory smooth ride. Kit includes all necessary parts and hardware, and requires no cutting or drilling. Made in the U.S.A.